Purchased From: Received as a gift, thanks! 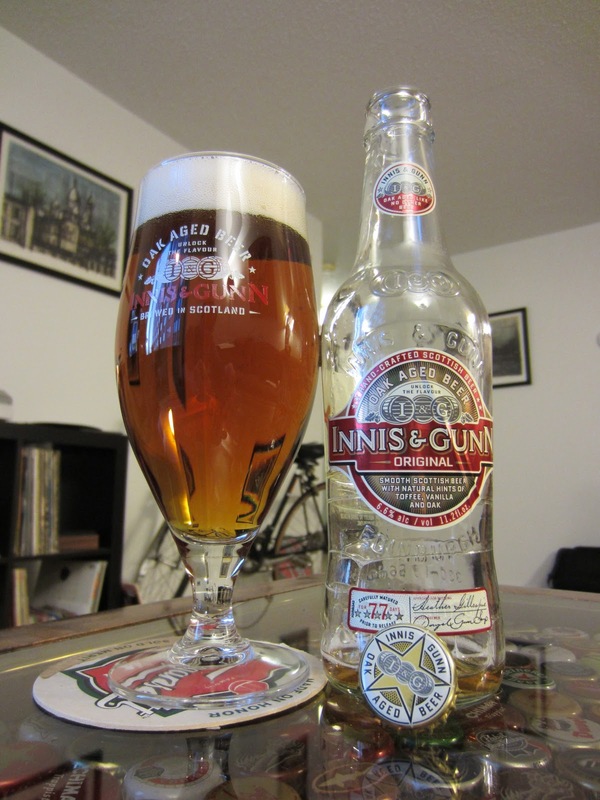 Innis & Gunn is a Scottish brewer that produces a line of barrel aged beers that show off not only their Scottish heritage, but pack huge characteristics of their aging vessels. This, the Original, is aged in oak barrels and pours a crystal-clear orangy amber body with a nearly-white head. The foam is light and airy, mustering moderate retention and light wispy lacing. The nose is potent with vanilla notes. Oak influence is huge and inluences the malt base adding hints of candy and a minor ice cream appeal. Vanilla and oak dominate the palate. Malts are strong and singular, but are overtaken by the tremendous barrel age character. The impact of the aging vessel absolutely defines the beer, pushing out almost every other flavor. The beer is aged only 77 days in oak, so it is surprising that the impact is so dramatic.